Janie Guy Winter will fascinate your mind through her Xlibris release. It is so UNIQUE, no matter kind of book you prefer, you will delight in its innovative literary approach. Safe to say, there is something for everyone in these pages. As ambitions as the topic is, its message might be the epiphany we are all looking for… whatever outcome, it’s a great read. It is a zany "soufflé" of humor, wit, gladness, and sadness through the eyes of today's times and yesterday’s nostalgia. It’s fascinating style juxtaposes hilarity and seriousness and weaves these two opposites into a mind blowing experience. The book covers a cornucopia of information from past to present; including historical facts, personal stories, and ideas your imagination will love. It will leave your mind reeling with wonder! It presents the alarming societal and political problems (even dealing with the nuclear danger dilemma) that people struggle with everyday and puts a spin of realism and humor on them. As a whole, it inspires the readers with the feeling that changing the world is not impossible and that miracles of thinking can influence the whole of humanity leaving the reader with a viable vision of peaceful coexistence. “My hope is that this awakening will lead to a new universal international mindset, and this new universal international mindset will overcome the current way of seeing war, forever deleting war as an option to solve anything,” says the author. 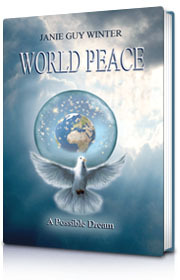 World Peace inspires readers with the knowledge that a beautiful, peaceful existence will soon be realized once the world’s ‘pioneers of peace’ are born. It is so enjoyable; you won’t want to put it down!